A cerebral cavernous malformation (CCM) is a blood vessel malformation, consisting of a tangle of, in particular, veins in the brains. A cavernous malformation can also be found in the spinal cord. 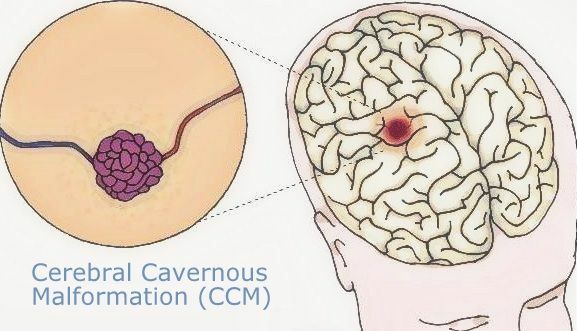 A cerebral cavernous malformation is located in the brain. The adjective ‘cerebral’ refers to the brains. The term "cavernous" means there is a tangle of tiny capillaries. A cavernous malformation is not the same as a tumor of blood vessels (cavernous hemangioma), but in rare cases, a CCM may have a large size that can leak through the thin blood vessel gradually and this may cause calcification. Often the surrounding brain tissue has a color of rust through the small haemorrhages. A cavernous malformation looks a little like a raspberry or a blackberry. In addition to this gradual leakage of a small amount of blood also a major bleeding may occur and this may give rise to all the characteristics of a cerebral haemorrhage. The neurological symptoms are then connected to the location in the brains. Epileptic seizures may also occur. A life-threatening brain hemorrhage is rare. The symptoms of a cavernous malformation vary depending on the severity of the bleeding and irritation of the brain tissue with possible epilepsy. To whom do these phenomena occur and how common is it? It is known that there are a few families in which an inherited form of CCM occurs. However, this is very rare. Usually cavernous malformations are not hereditary. In the United States it has been shown that this familial form of CCM occurs relatively more frequently in Hispanics. The first symptoms may appear between the 20th and 40th year of life. There are also younger people with CCM. Cavernous malformations are relatively rare. In half of the people who suffer from it a cavernous malformation gives no complaints. It occurs among men as often as among women. Usually there is a single cavernous malformation. However, some patients have multiple cavernous malformations in the central nervous system (brains and / or spinal cord). In contrast to other vascular malformations (such as an aneurysm and AVM) a cavernous malformation is not visible with a vascular examination, angiography, (contrast examination of the blood vessels), because the capillaries that take care of blood flow and blood drainage are often very small, so blood flows very slowly there. In case of an AVM, the blood feeding and blood draining vessels are larger. 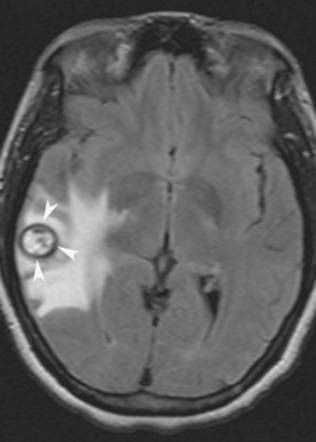 However, the diagnosis is usually well set with an MRI examination, because the typical characteristics can be visualized as a black ring of old hemorrhages around the cavernous malformation. Sometimes a calcification is found on a CT scan. Sometimes a CCM is accidentally discovered on MRI scans of the brains. Is it wise to have surgery on a cavernous malformation or not? What can be expected when nothing is done? Has the malformation already given problems such as epilepsy or complaints caused by hemorrhages / bleeding? The location of a cavernous malformation partly determines the decision to operate or not, but also the age of a patient and has his or her physical and neurological condition. The chance that surgery causes epilepsy is indeed also present and that is a dilemma for doctors. However, in some cases, the already existing epilepsy is reduced by the removal of the cavernous malformation. If the CCM is in an inaccessible place, near the main functions of the brains it is better to refrain from surgery. Doctors must therefore weigh up the chance of damage from surgery and the damage of waive an operation. And they must estimate the risk of the possibility that the cavernoma gives a great bleeding. In some people a CCM is discovered by accident. The question is whether there is a chance of this ever going to give symptoms during life. If it has geven no complaints so far, (asymptomatic) it is usually decided to wait and regularly take a picture to see how the course is and intervene later. For other treatments, other than surgery, there is no scientific evidence yet or lack the technical possibilities.